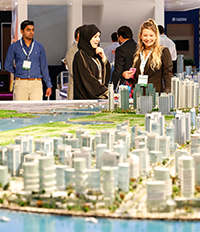 Abu Dhabi, UAE, 18 March, 2015: Investors from GCC countries continue to pour billions into both the local and foreign property market, as more than 130 exhibitors prepare to showcase their latest developments at Cityscape Abu Dhabi next month. According to international real estate firm JLL, investors in the GCC pumped $4.5billion into the global property market in the last quarter of 2014, of which more than $3.08billion was invested into the UK alone. Bob Clarke, Managing Director of Herald Land Real Estate Brokers LLC, who will be launching their latest project at the show said, “Over the years there has been a drastic rise in investment purchases from the region because investors in the Middle East see the UK as a secure region for long term investment. Buyers from the UAE now represent more than 18% of such property deals to foreign investors. Herald Land is participating alongside a number of British exhibitors at the UAE capital’s largest property event, which will cover more than 18,000sqm of exhibition space. With a stronger international feel, participation from Turkish and Jordanian exhibitors is growing significantly, as thousands of visitors from around the world prepare to descend upon the show. Other countries represented include Portugal, Latvia, Serbia, Cayman Islands, Nigeria, Egypt and many more. In addition to the capital’s key developers and banks, Cityscape Abu Dhabi will welcome new participants such as Eagle Hills Properties, as well as returning organisations including Aldar Properties, Tourism Development & Investment Company (TDIC), Al Forsan, Al Qudra, Bloom Properties, Manazel, Mubadala, Reem Developers and TMKN. Wouter Molman, Director of Cityscape Group at Informa Exhibitions, the organisers of Cityscape Abu Dhabi, said: “Reflecting the steady growth currently being witnessed in the market place, the event is forecasted to increase by over 15% again. The stability within the Abu Dhabi real estate sector bodes well for developers, investors and home buyers who will be visiting the show next month. “With confirmed exhibitors already reaching higher numbers than in previous years, we are adding another hall to meet the demand. Latest research and statistics coming from Abu Dhabi indicate that there is a renewed confidence in the property market with construction visibly moving again. After a successful launch edition last year, the ‘Abu Dhabi Market Overview’ Forum returns on the opening day (21 April), and will be hosted in collaboration with JLL and supported by Masdar City. The half-day Forum will draw attention to the Emirate’s latest trends and initiatives, including future developments and anticipated new real estate regulations. Cityscape Abu Dhabi is supported by Strategic Partner Department of Municipal Affairs (DMA), Platinum Sponsor Wahat Al Zaweya, Silver Sponsor Farglory, Official VIP Sponsor Ejadah Asset Management Group and Official Mortgage Provider Abu Dhabi Finance. For more information, or to be involved as an exhibitor, sponsor, or visitor, go to www.cityscapeabudhabi.com or call +9714 336 5161.